WHAT TO FIND IN THE 2014 NISSAN PATHFINDER SV AWD LOADED WITH SMART KEY WITH KEY LESS ENTRY AND PUSH BUTTON START, ON BOARD COMPUTER, REAR VIEW CAMERA, 6 DISC CD CHANGER, DUAL ZONE CLIMATE CONTROL, LEATHER WRAPPED MULTI-FUNCTION STEERING WHEEL, 3 ROW SEATS , HEATED DRIVER/PASSENGER SEATS, TIRE PRESSURE MONITORING SYSTEM AND MUCH MORE.................BAD CREDIT, NO CREDIT NO PROBLEM, APPROVAL IN MINUTES SAME-DAY DELIVERY GUARANTEED. 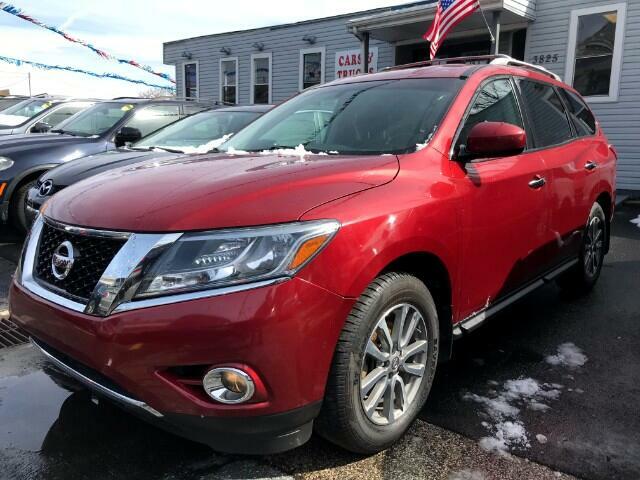 PLEASE CALL (215)288-5277.....PRICE IS BASED ON $2,000 DOWN PAYMENT,PURCHASE OF THE EXTENDED SERVICE PLAN FOR 2 YEARS AND 24,000 ADDITIONAL MILES.......TAX, TITLE, REG. DEALER FEES ARE NOT INCLUDED.